EXAMPLE 1 Multi-game Play—Single Jackpot/Division. The calculation is:  1   Super   Keno   share = Total   amount   held   in   respective   Super  Keno   Jackpot / Division   minus   ( House Tax + Seeding   to   respective   Super Keno   Jackpot ) Total   number   of   players   ( Super   Keno players   entered   in   the   winning   Super Keno   Jackpot / Division   at   result . It may be that casinos operating Super Keno may wish to link-up their Super Keno Jackpot amounts to provide larger Jackpots and more regular results. 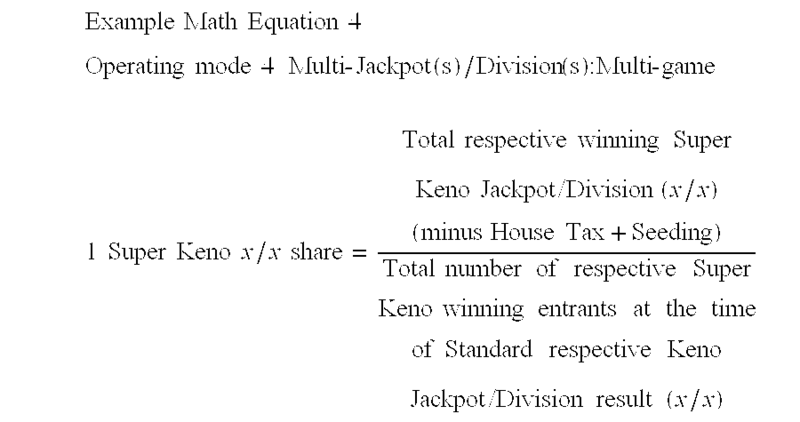 To do this it is necessary to operate all Keno (Standard) games at the same speed for all participating Casinos. All Super Keno information is to be displayed on display units per each participating casino. Exactly the same mode of operation will be used except it will be on a larger scale. FIG. 1 shows a block diagram of a standard Super Keno arrangement for a single operation and FIG. 2 shows a multi-linked arrangement.